Throwaway Pets becomes a literal term! This could just as easily have been a hermie. The people act like they didn't make the girls throw him out, but c'mon-saying, "Well, you can't get on the plane with it, so....." is the same as saying they have to throw it away. Also, if they were so worried about it carrying salmonella and bacteria.......odds are those girls already had the germs on their hands and had already touched hundreds of surfaces in the airport. Plus, what about the flight attendant who said to put it under their seat? Are there routinely staff that go against the airline policy on animals/cargo?! I'm sick and tired of people thinking because something is tiny that it's life doesn't count! I'm wondering if that could have sounded any more insulting to me or the crabbies?! I know! People get me very mad! Hermit crabs are a huge part of my life and without them I wouldn't be me. 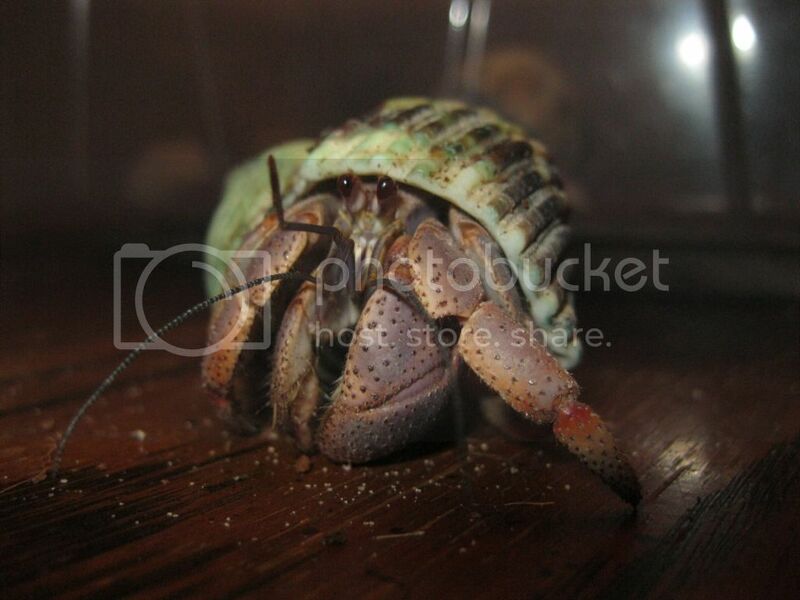 Hermit crabs are amazing and there life means alot. So, anyone that thinks because there small there life doesn't count they need to think twice. Thanks. LOL Sach... I get the what I call the 'crazy boat' response all the time. Remember my sister seriously wanted to give me to that hoarding show for because of my crabs! They just don't get it because they have never connected with the species. They stopped me at security and told me that I'd have to leave them here, I asked where "here" was and they said garbage...I said uhhh no! And they guy asked me what I would like him to do with the crabs all sarcastically...Uhhh just let me on the friggin plane with them! THANKFULLY my bf's didn't leave the airport yet and we got the crabs to them to return to the pet store...GRRRRRRRR still mad!!!!! This is madness! They can get really big out in the wild but in captivity people mistreat them sometimes because they think its like a TOY or something. If your gonna get a Hermit Crab, RESPECT IT. Yeah, I was a little bit ticked about it;especially since all those activities take place right in hermie territory. (she lives in San Diego where you can sometimes find compressus-"Es") My whole family thinks I am weird and obsessed. I have even run into people online ( ) who think I am a "psycho" for creating a forum and Facebook page for them. I see it like this: I stumbled upon having these little guys for pets and found out how smart,personable & fascinating they can be. They can live much longer than your average pet, they are cleaner, quieter & easier to care for than traditional pets and I feel SO bad that so much bad information is out there that thousands (at least) of these awesome creatures who have existed since the dawn of time are dying in bad conditions so I want to help them & their owners any way I can. is it bad to say emo here?? Sorry it took me so long to get back to you (I am 8 1/2 months pregnant and busy all the time now, hh). It's not bad to saay anything here unless it's a cuss word or something horribly mean/racist/sexist to someone. ok then cause yes whe has said she is and sadly, showed me the scars. just sick i tell you, SMD or self mutilation disorder is bad. Yes, it definitely is. Is there someone in authority you could tell that may be able to help her? She acts like her parents don't care, she does plenty of things and teachers overlook them and go I don't care what she's doing. Our whole class like hates mr. Porter and when ayla comes in with a post-crying face he just takes one look and probably thinks "she's not my problem, don't do anything". The class also laughs when he says things that sound dirty but are used in a normal term like when we got in groups of three and he called them threesomes, everyone laughed as he was like "why are you laughing? ".